If you want to try out Sonic Forces a few weeks early, a demo for the game is available now on the Japanese Nintendo Switch eShop and Japanese PlayStation Store. You can make a Japanese account if you want to try it out - and here’s how on Switch - though, um, you may not want to go through the effort in this specific case. 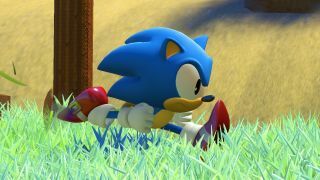 I'm not just being a 3D Sonic naysayer here, there's one very strange aspect of the demo that's souring just about everybody who plays it: you can only play for a minute at a time. The demo includes three stages: one where you try out modern Sonic (read: long-legged and green-eyed), one as classic Sonic (chubby and impatient), and one as the customizable "avatar" character (original, do not steal). They appear to be full stages from the game, but you can only play each one for a minute before the screen fades to black and a trailer starts playing. This has provoked significant consternation among players. If the 2D splendor of Sonic Mania has you hopeful for an equally good 3D Sonic game, you may want to start tempering your expectations now. Most of the reactions I saw didn't seem like they would have improved much given extra time to play. But! Not everybody's having a rotten time with the Sonic Forces demo. Maybe it'll work for you, too? We'll have to reserve full judgement until we can play more than a minute of the game, of course. Until then, why not revisit some of the classics with our list of the best Sonic games of all time?